Today, the Shamrock is the most common symbol of Ireland. Worldwide, the tender, three-leaf plant used by Saint Patrick to illustrate the presence of God in the natural world, is instantly recognized as a kind of logo for Irish culture. The leaves of this simple plant are meant to symbolize the Father, Son and The Holy Spirit in the Catholic Trinity. Saint Patrick used shamrocks to convert the Druids from their Pagan ways, by convincing them that the Holy Trinity was present in every lush, green field of their native land. Today, the Shamrock is displayed widely on Saint Patrick’s Day, when it is emblazoned on t-shirts, hats, parade banners and just about anything else it will fit on. Today’s Celtic jewelry designs often feature pretty Shamrocks that add a touch of Irish spirit to pendants or charm bracelets. There are many types of traditional Celtic interlace (knot work), and almost all of them contain meanings that have been lost in the mists of time. However, the simple, trefoil design of the trinity knot, or "triquetra," is easy to interpret and understand. Much like the shamrock, the Trinity Knot illustrates faith, devotion, and belief in God. Its three segments also symbolize the Holy Trinity. It’s similarities to the classic Irish Shamrock make it another well-known symbol of Ireland. This symbol has endured since the sixth century, when it began to emerge as a popular design motif on stone crosses, architecture and art and metal work. In Ireland, designers often use the symbol in homage to the master artisans of the past. The Irish have always been lauded for the skill and creativity they bring to metal work, including priceless museum pieces such as the Tara Brooch and the Ardagh Chalice. Today, the Trinity Knot is often used to adorn Celtic wedding rings and Celtic engagement rings. It may also appear alongside other Irish symbols, such as the shamrock. Brides and grooms find this symbol to be an appropriate and meaningful one as they make a lifetime commitment before God. For the Irish, the Harp symbol is a reminder of the first gifted performers of the Emerald Isle, who would travel far and wide as harpers and sometimes entertain at royal courts. The distinctive, layered sound of this instrument seems to pluck at the heartstrings, evoking all manner of emotions. 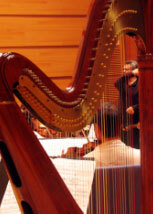 Likewise, the symbol of the harp provokes feelings of warmth and appreciation for the achievements of the Irish people. In days gone by, the harpist would be the most revered in any group of musicians, and his music would serve as the backdrop as Irish chieftains surged into battle. Today, the legacy of the Irish harp continues, on product logos (Guinness), and handmade arts and crafts. These curving circles seem to go on endlessly, spiraling into themselve. For the Irish, the whorl or spiral is a powerful symbol of life everlasting. Each turn of the circle reveals the passage through birth, death, and spiritual rebirth. Within the curved lines of each circular pattern, milestones can be marked and honored. This timeless symbol, always linked with life force and eternity, is a hypnotic rendering that calls to mind the rippling curls of a seashell. The force of the whorl design lies in its never-ending quality. Whorls appear on some of Ireland’s greatest art treasures, including the Ardagh Chalice, an exquisite cup made of beaten brass and gold. 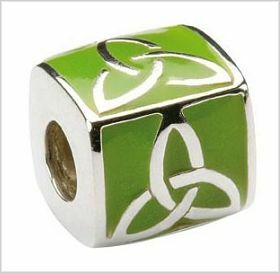 They also decorate many modern Celtic jewelry designs, and they can be used in concert with other Irish symbols. The romantic spirit of the Irish is echoed in the design of the Claddagh ring, with its crowned heart held by two tiny hands. The first Claddagh ring was created as a symbol of undying faithfulness and devotion, and today it is still a popular gift for lovers. However, many people exchange Claddagh rings and other jewelry featuring Claddagh symbols to honor platonic friendship. The crowned heart is a symbol of loyalty that hearkens back to the days when kings and queens ruled the territory of the British Isles and subjects swore fealty to the Crown. The two tiny hands that gently clasp the heart are protective and gentle. There is a sweetness to the Claddagh symbols, and a sense of purity and sincerity. For this reason, the symbols of the Claddagh continue to fascinate and inspire new generations. Today, the symbols appear in many unexpected places – on CD covers, on modern jewelry designs that use the symbols in new and inventive ways, and on posters for Irish and Celtic festivals.